Mexico is a country located in North America. It shares its land borders with the United States to the north and with Brazil and Guatemala to the south. The population of Mexico is just over 106 million, with the most Hispanic people outside of Spain; it’s also the third most populous country in the Americas after the United States and Brazil. Mexico has a large number of indigenous groups including the Aztecs, Maya and Zapotec. It’s a vacation destination par excellence. Whether you're looking for white sand, sports trips, adventure or to satisfy a passion for archeology, Mexico will amaze you. The favorite tourist destinations in Mexico are Acapulco, Cancun (and the Riviera Maya), Huatulco, Mazatlan, Puerto Vallarta, Manzanillo and Xtapa. Make you next vacation destination Mexico. You won’t be disappointed. Spanish; and 62 indigenous languages spoken by 7% of the population. Mexican Peso ($) (MXN). American money and credit cards are widely accepted in tourist areas. 130VAC, 60Hz - same electricity found in Canada. From typical shopping mall experiences to wandering through open markets or bazaars that have existed for centuries, you will find a diverse selection of goods in Mexico. It is actually at the bazaars where most of the better handmade arts and crafts items can be purchased. Some of the best buys include silver, pottery, handicrafts, and woven fabrics. Also at the markets, look for pure vanilla extract (which is native to Mexico), spices and Mexican chocolate – the latter of which is used for making a variety of hot and cold drinks (Atole, Tejate) as well as mole, a traditional sauce used to accompany chicken. Bargaining or haggling is a common practice at the markets, but is optional. And, of course, tequila is a very popular item. The water is not safe in Mexico. Drink bottled water! In Mexico, the average temperature is between 24°C and 28°C. The temperature remains high throughout the year with only a 5°C difference between average winter temperatures and summer. Most of Mexico experiences a wet (or rainy) season (or rainy season) from June to mid-October and a marked dry season. February and July are the driest month and wettest, respectively. For example, Mexico City gets about 5 mm of rain in February and 300 mm in July. Coastal areas, especially the Gulf of Mexico, receive their maximum rainfall in September. Tabasco has more than 300 mm of rain during September. 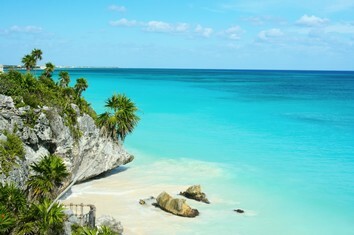 With its climate, you will live a dream holiday in Mexico. San Miguel de Allende is a historic town founded in 1542. It was an important stopover on the Antiguo Camino Real, part of the silver route from Zacatecas.The Sanctuary of Jesús de Nazareno de Atotonilco is a Jesuit sanctuary located 14 km from San Miguel. It is renowned for its Baroque art and architecture. Chichen Itza which means “at the mouth of the well of Itza “, is the 2nd most visited archeological site of Mexico today. The Kukulkan Pyramid in Chichen-Itza is one of the new seven wonders of the world elected in 07.07.2007. It is exactly 24 m. high considering the upper platform. There many more archaeological sites carrying traces from Mayan Culture. The Bahía de Banderas (Bay of Flags), on which Puerto Vallarta lies, boasts a good two dozen beaches extending north and south of the Rio Cuale which divides the town. The most famous beaches north of the river include Playa de las Glorias, Las Palmas, Oro and Chino in the state of Nayarit. This archeological museum features Mayan artifacts. It was built in 1982 and houses approximately 800 objects belonging to the Maya Culture, found at the archaeological compounds of El Rey, Coba and Tulum, which are part of the attractions in the region.The Museum's pre-Hispanic treasure is composed of ceramics, sculptures, carved monoliths, and other stone works. The Basílica de Nuestra Señora de la Soledad church was constructed between 1682 and 1690 and has an atrium of limestone blocks surrounded by a covered walkway at a higher level. The figure of the Virgen de la Soledad wears a black robe of velvet embroidered with gold and other precious stones, and a particularly large pearl on her forehead. Although marine life in the waters around Cozumel has already suffered considerably snorkellers and scuba-divers can still find much to interest them. One of the best spots to dive is the Palancar reef, rising from depths of 80 m to just beneath the surface at the south-west end of the island, where a bronze figure of Christ has been erected underwater. The Grutas de García, one of the country's largest and most beautiful cave systems, is reached by following the MEX 40 for another 6km/4mi after Cañon de la Huasteca, then taking a right-hand turn and continuing for a further 24km/15mi. The entrance to the caves is reached by taking a cableway. The church of Santa Mónica was built in the first half of the 17th c. The Baroque façade, with Salomonic twisted columns, is covered with rich and intricately-carved ornamentaion, including grapes, cobs of maize, angels, double eagles and symbols of religious orders. An early and impressive statue of St Christopher looks down on the passing traffic. The present church was constructed on the site of an earlier 16th-century church that was finished in 1709, the Old Basilica. When this basilica became dangerous due to the sinking of its foundations, a modern structure called the New Basilica was built next to it; the original image of the Virgin of Guadalupe is now housed in this New Basilica.